In general, cardiac catheterization is a minimally invasive procedure done to get information about the heart muscle and its blood supply or to provide treatments such as intracoronary stents in certain types of heart conditions. It may also be used to determine the need for heart surgery or other procedures. Diagnose or evaluate coronary artery disease. Diagnose or evaluate congenital heart disease. Diagnose or evaluate problems with heart valves. Diagnose causes of heart failure or cardiomyopathy. In addition to its use as a diagnostic tool, cardiac catherization can also be used as an interventional procedure to treat heart attacks, to open blocked arteries with balloons and stents, and/or repair stenotic, or narrowed heart valves. In the United States, a majority of cardiac catheterizations (90-95%) are performed through the femoral artery, the large artery supplying blood to your leg, which is accessed through the groin. Although generally considered safe, this approach presents a slightly higher risk of bleeding compared to cardiac catheterization through the radial artery in the wrist. What is transradial cardiac catheterization? Transradial cardiac catheterization offers a less invasive, lower-risk option compared to traditional femoral artery access for cardiac catheterization because the procedure is performed through a small artery in the wrist rather than in the groin. This allows for a quicker recovery time and a shorter hospital stay. Immediately after the procedure, patients should be able to sit up, eat and walk. In contrast, after a traditional cardiac catheterization through the femoral artery in the groin, patients must lie flat for two to six hours, in order to ensure that bleeding will not occur from the site. Furthermore, the femoral artery is adjacent to the abdominal cavity. Inadvertent puncture through the femoral artery can lead to blood loss into a very large space, the retroperitoneal cavity that is behind the abdomen. Every year someone in every large city in America dies of a large bleed into this space that is either not stopped or not appreciated. Transradial access for heart catheterization is without this risk, 100%. Blood loss from the radial artery is simply compressed with a finger. The physicians of First Coast Heart and Vascular Center are some of the only cardiologists in North Florida who routinely offer transradial cardiac catheterization and transradial coronary intervention procedures, such as angioplasty and stenting procedures. A determination is made to confirm that the patient is eligible and safe for radial artery catheterization. The patient is sterilely prepped, and minimally sedated. The wrist area is anesthetized and accessed with a small needle. Catheters are then inserted and advanced to the heart arteries. The rest of the procedure is identical as if it were being performed from the traditional femoral approach. 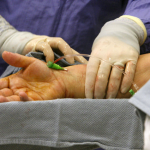 The catheter is then inserted through the wrist (radial artery) and is threaded through to the heart and its chambers. A wristband is used to compress the artery when the procedure is finished and the patient is able to ambulate almost immediately after the procedure. What are the benefits/advantages of transradial versus traditional cardiac catheterization? Reduced risk of bleeding and damage to blood vessels. Patients can sit up, walk and eat immediately after the procedure, rather than the typical two to six hours lying flat after femoral access. Shorter hospital stay or outpatient facility stay. Potential discharge to home the same day even after stenting procedures. Who is eligible for transradial cardiac catheterization? Despite the advantages to this approach, the procedure may not be appropriate for a very small number of patients. Patients with inadequate blood supply to the hand due to prior surgeries on arteries or other injuries or causes of vascular insufficiency to the hand or wrist. We evaluate each patient’s case carefully to determine the best type of procedure to perform. We encourage patients to ask our team about this form of diagnostic testing to see if it is appropriate for them. Why doesn’t every cardiologist perform transradial cardiac catheterization procedures? This is a common question and one that is difficult to answer. Some doctors have either never trained to do the procedure, or are reluctant to change their established practice. If transradial cardiac catheterization is safer for the patient and associated with fewer complications, the physicians of First Coast Heart and Vascular Center believe it should be an option for every patient if appropriate. Why come to First Coast Heart and Vascular Center? Patients at First Coast Heart and Vascular Center are cared for by a multi-disciplinary team of board certified general and interventional cardiologists alongside electrophysiologists who work together to formulate individualized treatment plans based on each patient’s specific needs and disease stage. Our doctors have a dedicated team to consult on simple to complex cases of hypertension, heart failure, atrial fibrillation, coronary artery disease, heart valve disease, vascular diseases, leg ulcers, leg pain, vein diseases (varicose veins), leg swelling, carotid disease, mesenteric and renal artery diseases. For more information call our main office number (904) 423-0010 for all of our 8 locations. We see patients at most hospitals in Duval, Clay, St. Johns and Flagler Counties. Our team of doctors, L. Van Crisco, Vincent Caracciolo, Dinesh Pubbi, Kevin Hayes, David Grech, Neil Sanghvi and Christopher Edwards work in collaboration with the best area cardiac surgeons for your best results.